Photos by Brandon Macz: An ailing Norway Maple tree is proposed for removal to make way for a side sewer line connection for the Queen Anne Elementary addition. Seattle Parks and Recreation, which owns the property where the tree is located, has temporarily revoked a permit to remove the Norway Maple. 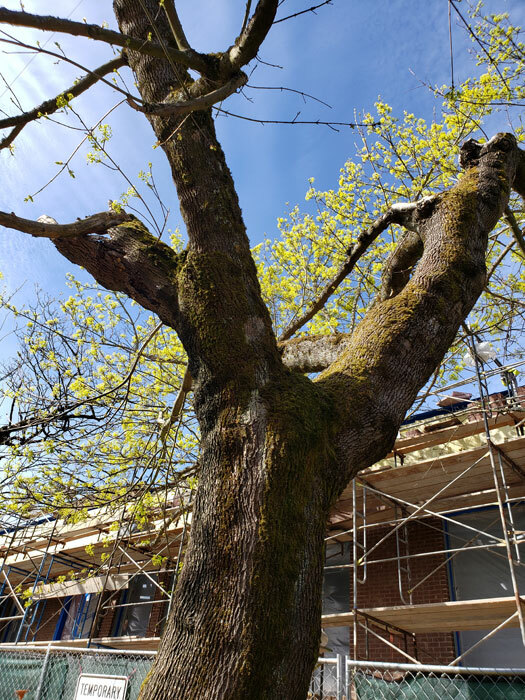 Update 4/9: Seattle Parks and Recreation will reissue a permit to remove a Norway Maple, after another assessment concluded again that its structural condition is poor. The SPR Urban Forest Tree Crew determined that years of pruning the tops of Tree #70 creating poor branching unions that resulted in wounds and wood decay. One large stem was determined to be a threat to pedestrians due to its level of decay. Seattle City Council District 7 candidate Don Harper is fighting the proposed removal of a tree along Bigelow Avenue North that would make way for a sewer line connection to the Queen Anne Elementary addition that remains under construction. Seattle Public Schools is building the addition with BEX IV Capital Levy funds approved in 2013 to provide eight new classrooms, a cafeteria and gymnasium to accommodate 500 students. Students were relocated to the John Marshall building in Ravenna during construction and are expected to return in September. A State Environmental Policy Act Environmental Checklist was completed for the project in 2017 and a Determination of Non-Significance was reached, meaning the project was not expected to cause any significant impacts. Tree Solutions, Inc. inventoried and assessed 48 trees with a diameter of six inches or greater on the project site, 15 of which are on Bigelow Avenue North. None of the trees were determined to be exceptional under City of Seattle standards, and some between the original school and addition did need to be removed. “None of the trees located on Parks property on Bigelow Avenue N would be removed,” according to the DNS. But a design error may now require removing a Norway Maple tree on Bigelow Avenue North in order to connect a side sewer line to the addition. 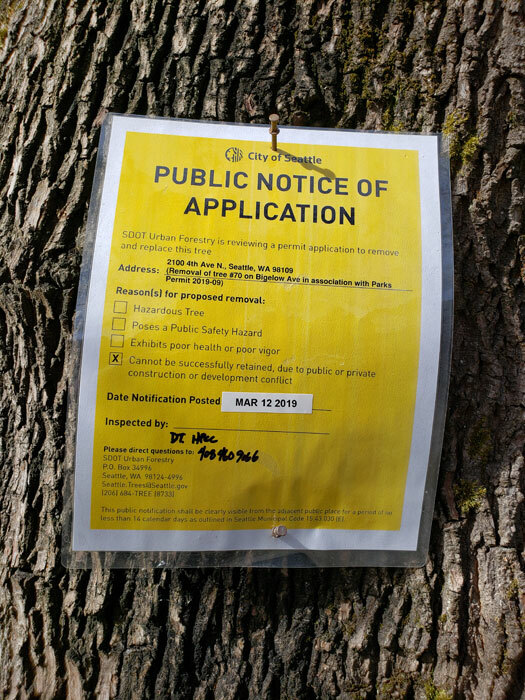 Notice of an application to remove the Norway Maple, labeled Tree #70, was posted on March 12. Harper wrote an email to interim Seattle Parks and Recreation superintendent Christoper Williams, protesting the planned removal of the tree and questioning SPR’s commitment to environmental stewardship, which resulted in the permit for the tree’s removal being temporarily revoked. Arborists believe Tree #70 will only survive about another decade, repeated pruning of trees along Bigelow due to overhead utilities having negatively impacted their health, according to Dahl’s memo. Heavy pruning was conducted in July 2018, prior to construction starting on the addition, but after the arborist’s report was completed. The preferred option would require running a new trench through the root zones of Tree #69 — a more healthy tree — and Tree #70, which might not survive the root damage this work would cause, according to the memo. SPS would need to replace it with two new trees. Harper chairs the Queen Anne Community Council’s Parks Committee, and provided an update during QACC’s April 3 meeting. Options that spare Tree #70 would be more costly, Harper said, but he is not concerned about that. “We’re not talking that much more money,” he said. The environmental report states no trees would need to be removed on Bigelow, Harper said, and if the Norway Maple is removed, , he and other tree advocates may file a lawsuit against the school district and parks department. Queen Anne resident Justin Allegro asked whether all of the additional work to assess the health of the tree and potentially work around it could prevent construction from being completed in time for the planned reopening of Queen Anne Elementary in September. “It’s not my concern, as a person who cares about parks and who cares about trees,” Harper said. SPS spokesperson Tom Redman tells Queen Anne News the issue is under review, but declined to provide any more information. Seattle Parks and Recreation tells Queen Anne News crews were out assessing the health of the tree, and the results should be available on Friday. Update: Now SPR states it needs until Monday.